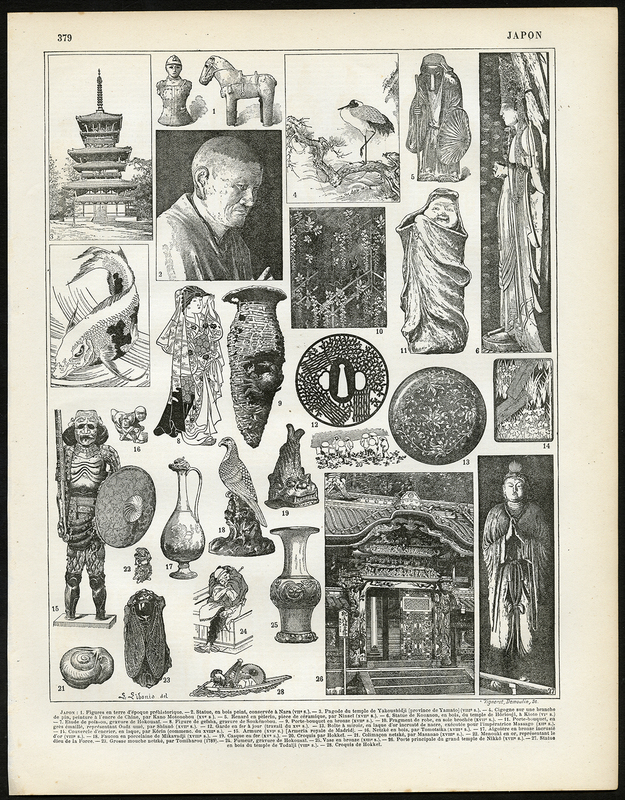 Subject: Antique print, titled: 'Japon.' - (Japan). This plate shows Japanese (applied) art and architecture. Condition: Excellent, given age. Irregular left paper edge from binding. Some small stains in margin. General age-related toning and/or occasional minor defects from handling. Please study scan carefully. Medium: Lithograph using rastering techniques on wove paper. Size (in cm): The overall size is ca. 24.2 x 31.2 cm. The image size is ca. 20 x 27.8 cm. Size (in inch): The overall size is ca. 9.5 x 12.3 inch. The image size is ca. 7.9 x 10.9 inch. Description: This lithographic print originates from: 'Nouveau Larousse Illustre en sept volumes. ', Directeur Claude Auge, Paris, published 1897-1904, with a supplement addedin 1907. The Nouveau Larousse illustre (New Larousse Illustrated) was an illustrated French language encyclopedia published by Larousse between 1897-1904, in 7 volumes and a supplement. It was essentially a scaled-down version of the 'Grand dictionnaire universel du XIXe siecle.' (Great universal dictionary of the 19th century) of Pierre Larousse, but updated and written in a more neutral, scientific style under the editorship of Claude Auge. Artists and Engravers: Made by 'Pierre Larousse' after an anonymous artist. Pierre Larousse (1817-1875). Claude Auge (1854-1924). Plate by M. Dessertenne.